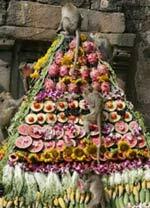 Monkeys grab food during the Monkey Buffet Festival at at the Pra Prang Sam Yot temple in Lopburi. Monkeys grab food at the Pra Prang Sam Yot temple during the Monkey Buffet Festival in Lopburi, about 150 km (92 miles) north of Bangkok November 26, 2006. The annual festival provides various types of food and drink to the local monkey population, which numbers more than 2,000. Located in the Lopburi province in Central Thailand, the city of Lopburi is best known for its population of 600+ urban-adapted monkeys. During the last weekend of November, Thais and tourists alike flock to the shrine of San Pra Kan, cameras in hand, to witness the events of the annual Monkey Festival, where the local macaques feast on a buffet of fruits, boiled eggs, soft drinks, cucumbers and (yes, the cartoons were right) gluttonous amounts of bananas. If you can't make it to Lopburi during festival season, the city is well worth the 3-hour train ride from Bangkok (through Ayutthaya). Prang Sam Yot, a Khmer temple located just north of the train station, is the centre of activity. It also operates as monkey headquarters, though the temple's windows and doors are gated to ensure a monkey-free exploration of one of the oldest ruins in Lopburi. Still, the monkeys congregate on the temple's lawns, climbing Buddha statues or fighting playfully, unfazed by the humans around them. 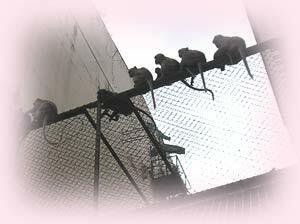 A 30 baht entrance fee includes the loan of a long bamboo stick for self-defense against aggresively curious primates. This allows tourists to play Indiana Jones for an afternoon, exploring the solemn stone temple and it's crumbling Buddhas. All the while, the fearless creatures won't hesitate to climb onto their unsuspecting spectators. These monkeys are said to have been a gift to the town centuries ago, when Hanuman the Monkey King was granted rule of the area by the mythic Hindu figure Rama. Centuries later, their presence in the town still works as a gift of sorts. While drivers and cyclists need to stay alert at all times for the roaming primates swinging about the city centre, these monkeys also draw tourists year-round, putting Lopburi on the map with this truly unique attraction.